How come there were no witnesses to the monster when the chamber of secrets was first opened? CoS Ch.13 In my fifth year, the Chamber was opened and the monster attacked several students, finally killing one. If there were witnesses to the attacks, then how come Hagrid was expelled? Even with Petrification, the students must have known that it was a basilisk that attacked them. It's hard to believe that a huge snake was able to attack several students and everyone ended up blaming a huge spider. They may not have seen the creature that attacked them clearly. The students who were attacked might not necessarily have a clear description of the creature that did it. Although Myrtle was attacked by the basilisk, she only remembered its yellow eyes - she didn’t remember what the creature that killed her looked like. Since she couldn’t identify why she died, it’s likely the other students couldn’t identify what attacked them, either, so wouldn’t be much help in determining what the real culprit was. Short answer: there weren't any witnesses to the giant snake, but there were witnesses to the giant spider. A pair of great big yellow eyes, watching me, over there. 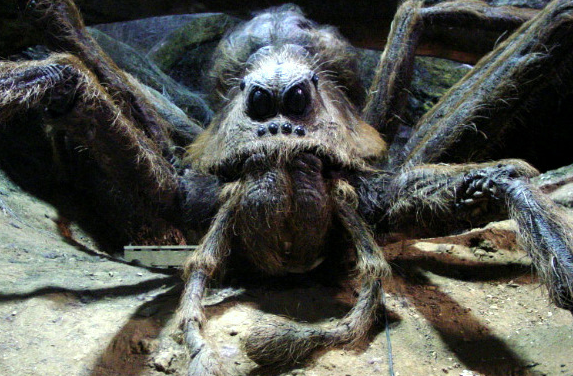 Spiders have eight eyes, but two of their eyes are bigger than the others. How is it possible to mistake a spider for a snake? Myrtle had been crying, and wore thick glasses. She had also just been murdered by the gaze of a magical beast that was capable of petrifying multiple students 5 decades later. The word of Myrtle alone would have been enough, but given that Riddle was a beloved student at Hogwarts, whose teachers were all said to be enamoured by, it's not surprising that it was easy to pin the blame on Hagrid. Additionally, it is said in The Chamber Of Secrets that the attacks stopped after Hagrid's expulsion, likely because Riddle was lying low. Apparently she died so fast and abruptly that she wasn't able to analyze the circumstances. Probably is was the same case with others (we don't know how many there were, maybe just a couple) - their attention was naturally drawn to the big yellow eyes first so they couldn't catch the details. Could it be that an attacked person saw the snake from a side\back view first and only then met it's eyes? It could, but it just didn't happened. By chance they all met the Basilisk suddenly and straight eye-to-eye. Consider when the attacks were. Firstly, during the Halloween feast. Later, late at night. After that, during class. After that, before a quidditch game. All of the attacks were timed when there wouldn't be people wandering around to spot things. The attacks were orchestrated by a skilled, powerful wizard who didn't want people to know the details of the attack. As Myrtle notes, the basilisk can be very sneaky, and they were aided by a powerful wizard. This was true in the past as well, during the first attacks. In the summer of his sixteenth year, he left the orphanage to which he returned annually and set off to find his Gaunt relatives. And now, Harry, if you will stand ..."
Not the answer you're looking for? Browse other questions tagged harry-potter voldemort basilisk or ask your own question. Did the Death Eaters know that it was Voldemort who first opened the Chamber of Secrets? After Harry opened the Chamber of Secrets why did no-one try to open it again? What were the 'Secrets' in the Chamber? Why could no one guess that a Basilisk was the monster? Why didn't Dobby just steal the diary? Is there a continuity error between “Half Blood Prince” and “Chamber of Secrets” regarding the time the Chamber was first opened?